The Honda Civic received criticism last year for falling sales, and supply shortages, and received a poor Consumer Reports review. But things are improving for the Civic in 2012. Despite competitors' hopes and wishes to the contrary, the Honda Civic is still a winner. The car evolved from the motorcycle business that Soichiro Honda built beginning in 1948. By 1959, Honda was the largest motorcycle manufacturer in the world as well as the largest internal combustion engine manufacturer. The first Honda car, the S500, was introduced in 1963 with chain-driven rear wheels. The Civic evolved in less than a decade as a two-door model with front wheel drive and a 1.2-liter transverse front engine. The interior was sparse but the car won applause for being fuel-efficient and reliable, two things most American cars were not. The ninth generation Honda Civic went on sale in April 2011 as a 2012 model just after the Japanese earthquake and tsunami. The disasters significantly damaged Honda’s parts supply and engineering center in Japan thereby muting the introduction of the new Civic. But production has been ramped up this year at the North American plants in Canada and Indiana. In the first two months of this year 84,678 Civics have been made versus 50,056 last year. The Indiana plant has added a new production shift and began production of the Civic Natural gas sedan. Today there are six different versions of Civic - the Civic Sedan (in DX, LX and EX trim levels), Civic Coupe, sporty Civic Si (Coupe and Sedan), Civic HF high fuel economy model, the Civic Natural gas, and the Civic Hybrid. 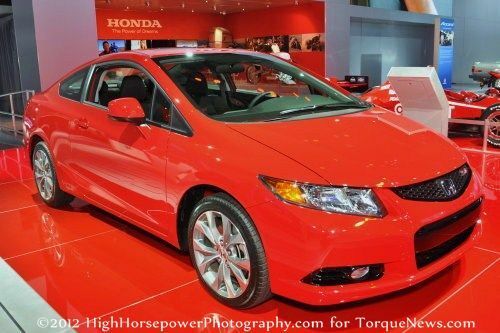 The 2012 Honda Civic has the same dimensions as the outgoing model: 177.3” length, 69” width, and 56.5” height. The wheelbase is slightly shorter at 105.1”. The base model is a 1.8-liter gas engine delivering 140 horsepower and 128 pound-feet of torque delivering 28/39-fuel economy with the automatic. The HF model (high fuel-economy) adds aero wheels with lower rolling-resistance rubber, rear deck lid spoiler, and an extra rear undercover to improve mileage to 29/41. But this model sacrifices some handling and tire grip and costs $3650 more than the base model. It will require saving about 1000 gallons of gas at $3.65 per gallon to pay out the difference. Forget about it. Of course more luxury and features are added at each step from the base DX to the LX, the EX, and the EX-L. And you can get the Civic in a four-door sedan or sportier two-door coupe. Base prices of the 2012 Honda Civic start at $15,805 for the DX and go up to $21,955 for the EX-L. There is a Natural Gas version using the 1.8-liter engine that delivers the same 27/38 mpg as the regular gas models but costs $26,155. The Hybrid employs a 1.6-liter engine with a lithium-ion battery that is more powerful than the last version. Combined power is now 110 horsepower and 127 pound-feet of torque delivering 44/44 mpg with 0 to 60 acceleration in around 10.5 seconds versus about 8.8 seconds for the gas model. But here again, the price is an issue. Base price is $24,050. Financially, one is better off buying the base model and paying the higher gas cost. The “performance” model is the Civic Si with a 2.4-liter engine that delivers 201 horsepower at a 7000 rpm redline. Torque is 170 foot-pounds and mileage is 22/31. The car zips from 0-60 in about six seconds. Base price is $22,405 but is well equipped with primarily the navigation system as an option. While most coverage of the Honda Civic over the years has been very positive, one black mark is Consumer Reports’ assessment last year. The magazine did not rank the Civic among their recommended small cars even though it was their “top pick” in its segment six times in the past 15 years. The magazine criticized the interior materials quality, a choppy ride, and road noise. These characteristics are consistent with most cars in that class as manufacturers attempt to hit specific price points and are limited by the relatively short wheelbase. It’s hard to see how the magazine thought other cars in the segment were much better. Other magazines differ in opinion. Motor Trend named the last generation Civic the 2006 Car of the Year, a very prestigious award. They have been very complimentary of the changes made in the newest generation and rank it number two in the segment. In fact, Motor Trend says “Whereas the Gen 8 Civic delivered a somewhat busy ride, relatively high NVH, and quick-feeling reflexes, the Gen 9 is smoother, quieter, more refined, and more deliberate.” This is exactly opposite the “black mark” imposed on the vehicle by Consumer Reports. It’s impossible to overstate just how popular the Honda Civic is. In 2010, before the natural disaster-induced supply issues, Honda sold more Civics in the U.S. than BMWs were sold. Make that more than all BMWs including Mini and Rolls-Royce. Honda is the fourth largest auto brand in the U.S. behind Ford, Chevrolet, and Toyota. Honda Civic is the fifth largest selling vehicle in America right now behind two pickup brands (Ford F Series and Chevy Silverado), the Toyota Camry, and the Nissan Altima. And if you combined Civic sales with its SUV sister, the Honda CR-V, together they would be the number one selling vehicle in America. The new Civic definitely is a winner. Its year-to-date 2012 sales are up 45% from 2011 and is the number one selling compact car. Seemingly, consumers don’t agree with Consumer’s. By Steve Odland. From January 2001 to March 2005, Odland was the Chairman and Chief Executive Officer of AutoZone, Inc., an auto parts retailer.